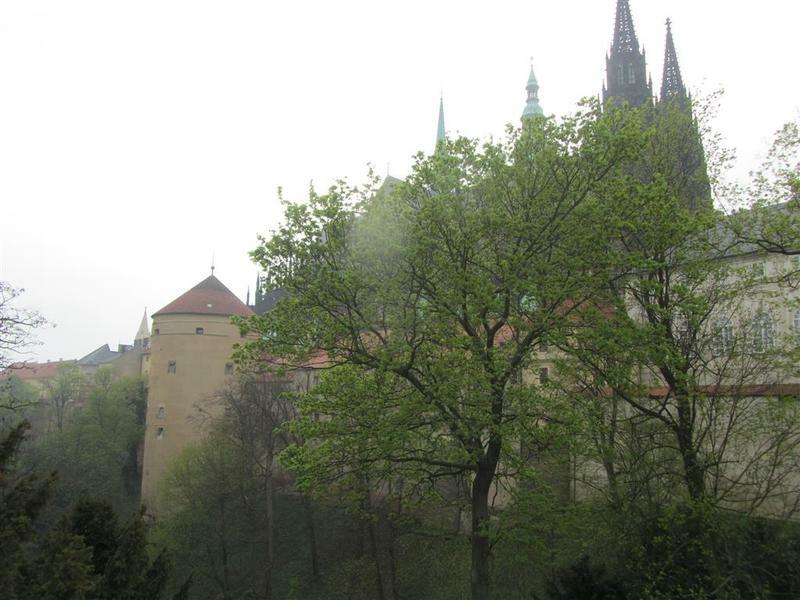 A misty day out at the majestic Prague Castle ended up taking us to a walk over the Vltava River via Charles Bridge. By this time, the clouds had parted and gave us a hot sunny blue sky day. 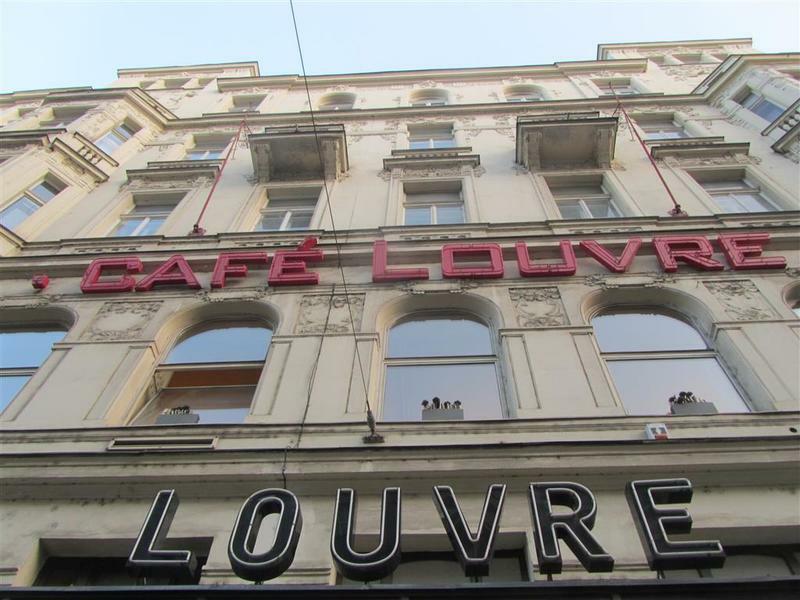 A place that we had in mind for an early dinner was Cafe Louvre. 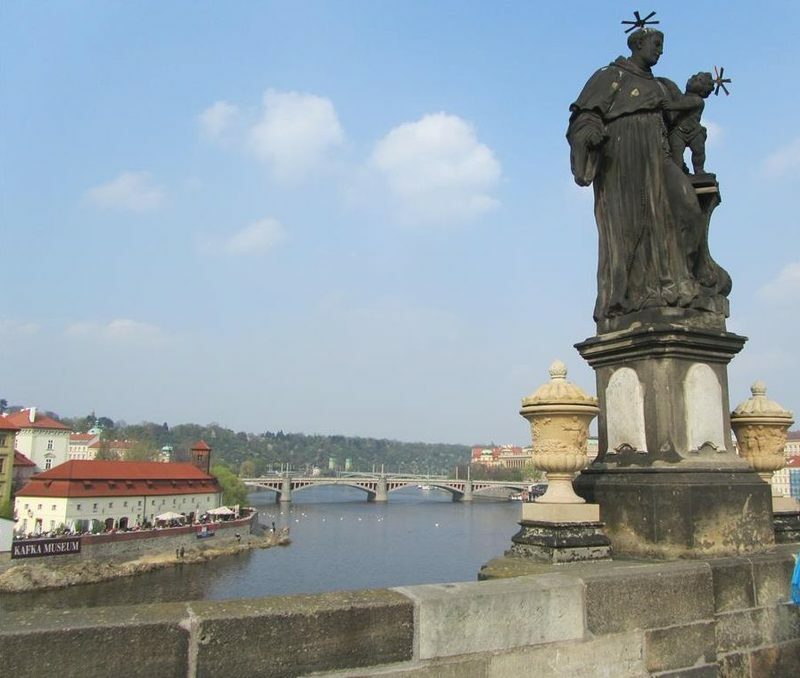 Although it was only a short walk away from Charles Bridge, it took a few times walking up and down the street to find it. This was in part that the restaurant entrance was slightly set back from the road and that the sign of the restaurant was attached to the upper level of the building. 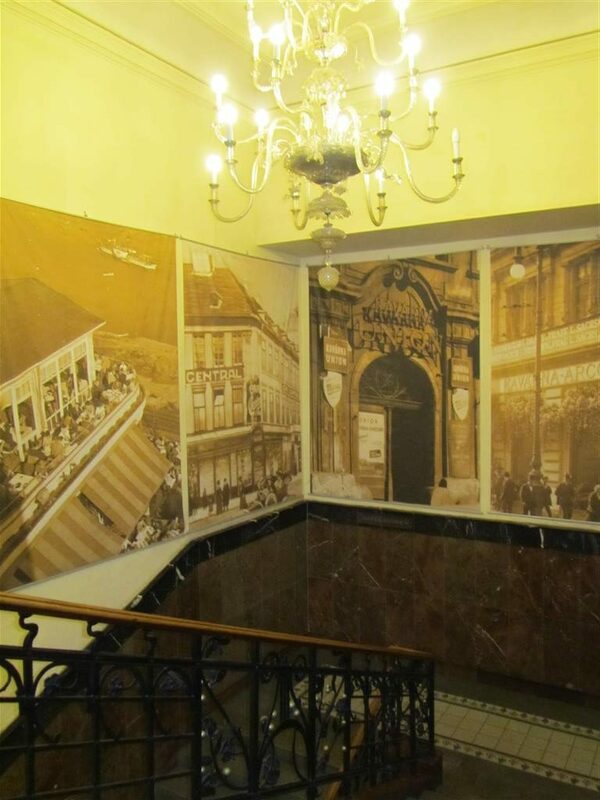 Cafe Louvre is on the first floor and is reached via a staircase with old pictures and a chandelier. 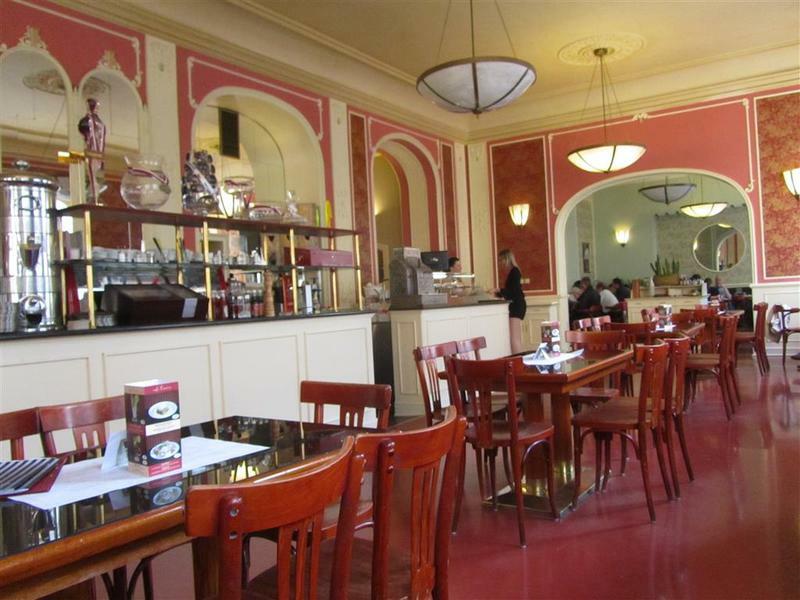 The restaurant was established in 1902 and the likes of Albert Einstein had visited here. The restaurant has quite grand spacious surroundings. 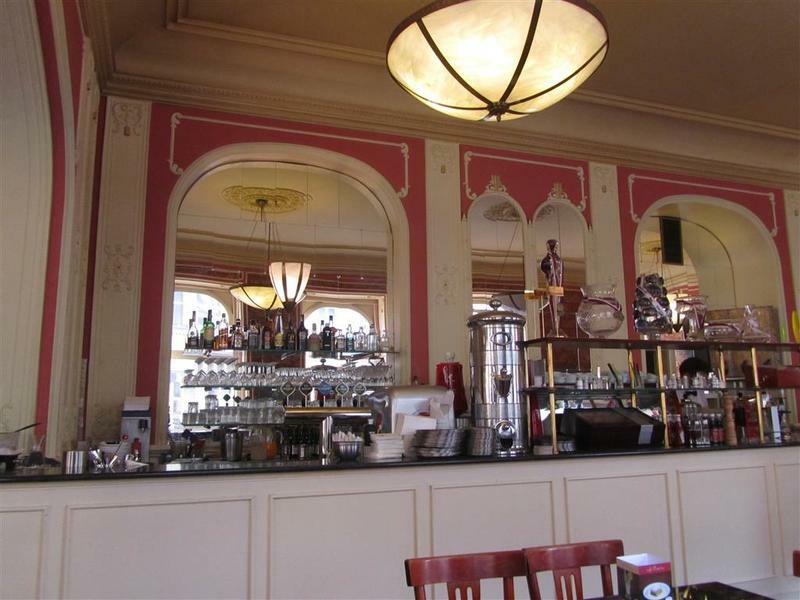 Pink walls and mirrors make up the art deco interior. 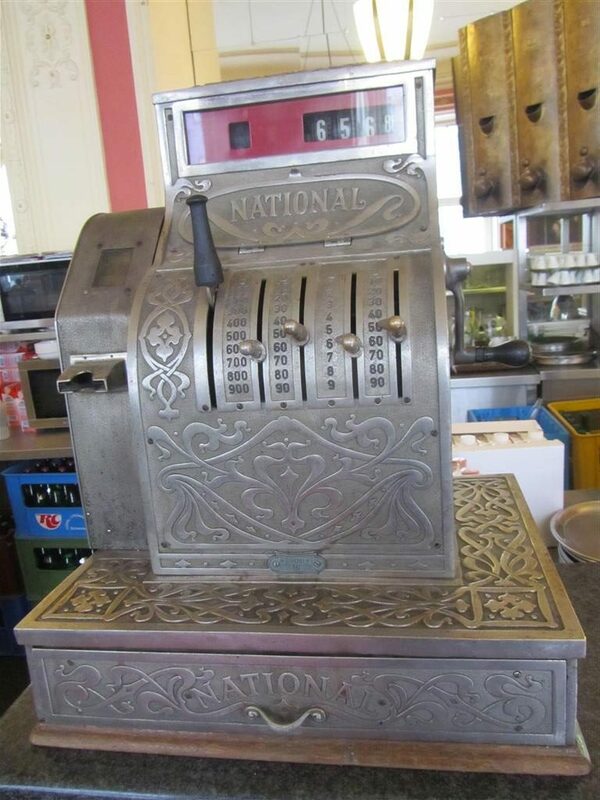 There is an old style cash register which makes for a nice feature at one of the counters. A much needed refreshing freshly pressed orange juice with strawberry quenched the thirst. It was a pretty drink with the two layers of the red and orange. 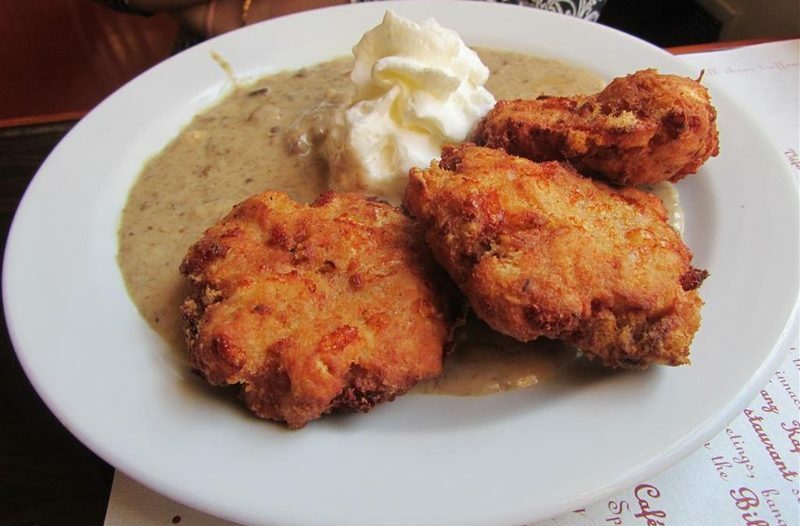 Three big fried cheese dumplings in a mushroom sauce made up this traditional Czech dish at Cafe Louvre. It came with some whipped cream for added creaminess. The dumplings were also made with the addition of bread. It was a tasty and hearty dish. To cut through the heavy dumpling dish, the grilled vegetables made for a good choice. 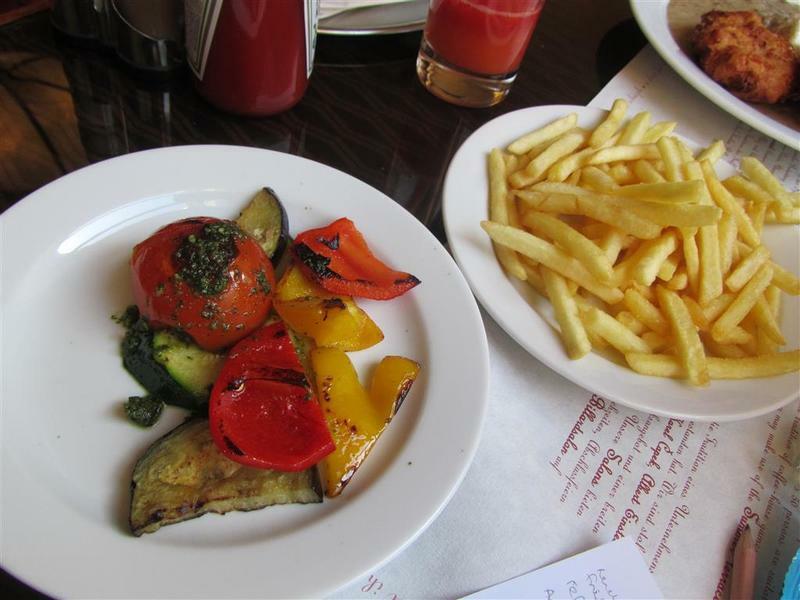 These were a small portion of tender grilled courgettes, aubergine, peppers and tomatoes. A portion of fries completed the meal. Cake is always welcomed at the end of the meal. 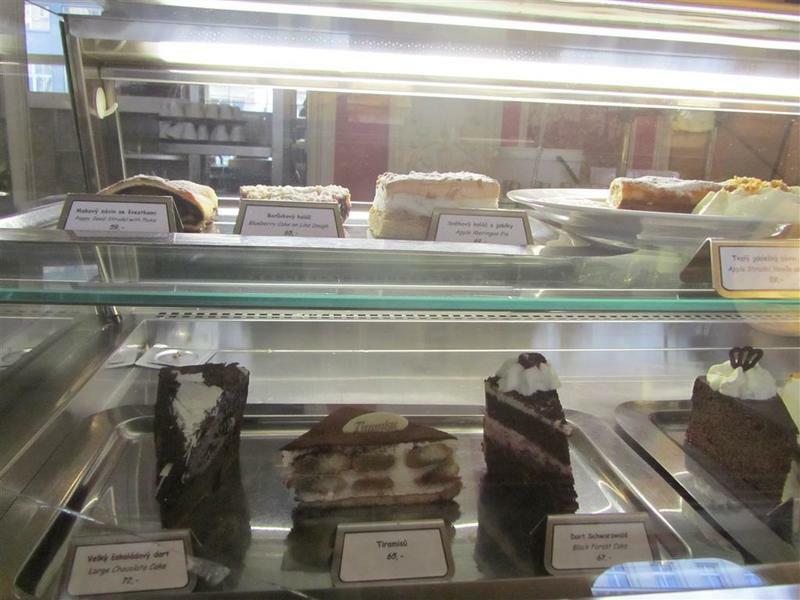 There was a good range of fresh cakes to choose from. The black forest cake was delicious. 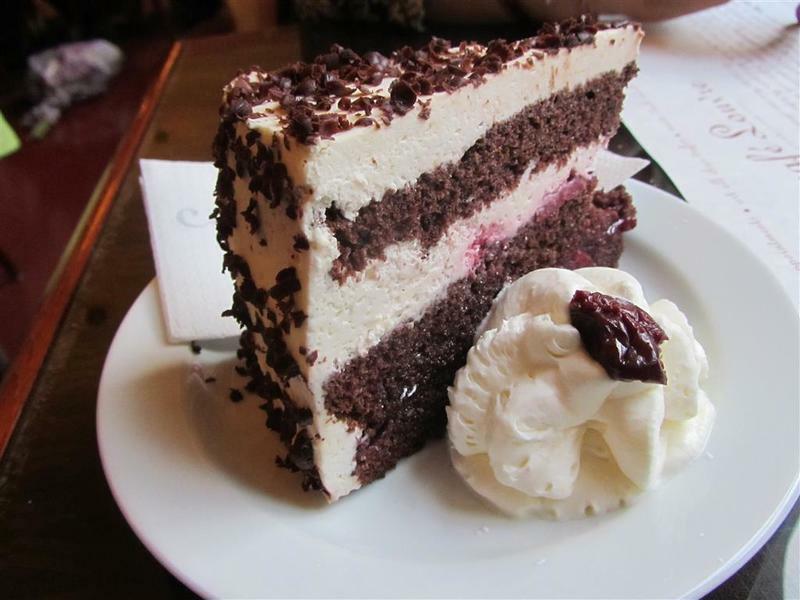 A light chocolate sponge with thick cream layers and cherries was wonderful. Again, whipped cream was on the side. Cafe Louvre is a great place for a relaxed meal. 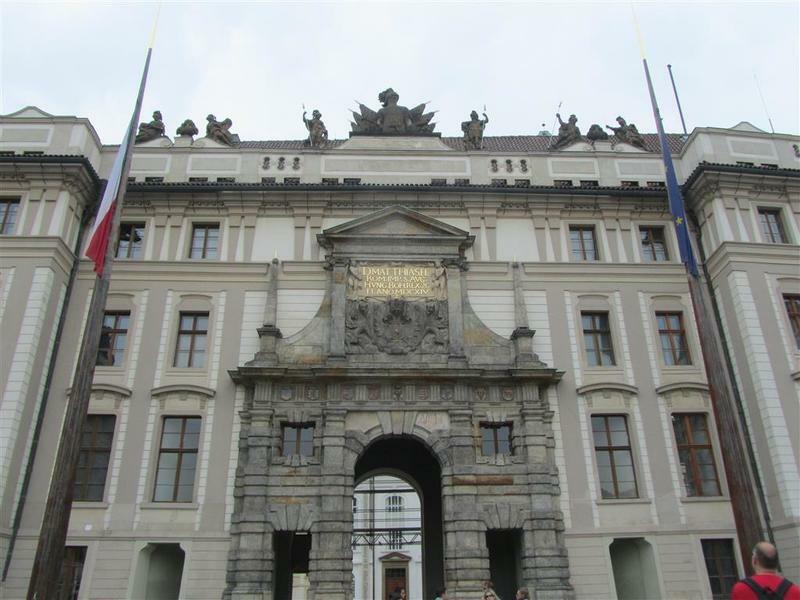 Dining in grand surroundings with flavoursome food made a good end to a magical day out in the city of Prague.